"White chocolate, milk chocolate, semi-sweet chocolate, and Reese's® peanut butter chocolate, all in one cookie!" Beat butter, white sugar, and brown sugar together in a bowl with an electric mixer until creamy. Beat eggs and vanilla into butter mixture until eggs are completely incorporated. Whisk flour, baking soda, and salt together in a bowl. Add flour mixture to butter mixture and stir to combine. 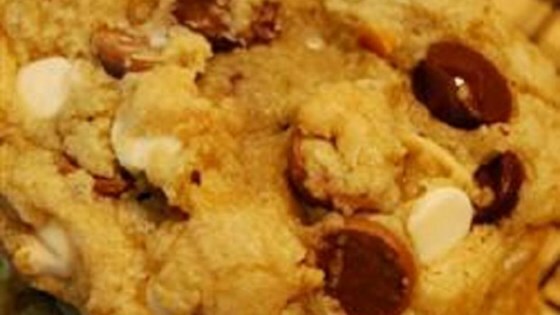 Fold white chocolate chips, milk chocolate chips, semisweet chocolate chips, and peanut butter chips into dough. Cover bowl with plastic wrap and refrigerate until dough is firm, about 2 hours. Drop spoonfuls of the cookie dough 2 inches apart onto baking sheets. Bake in the preheated oven until cookies are lightly browned and puffed up, 10 to 12 minutes. Cool on the baking sheet for 5 minutes before transferring to a wire rack to cool completely. Soft and chewy pale green sugar cookies with white chocolate chips.